Snowmaking guns blaze away on Aspen Mountain Nov. 9. The system salvaged the season last year and allowed this year's early opening. Skico wants to expand the system by 53 acres on the mountaintop. Snowmaking salvaged the season at Aspen Mountain in 2017-18 and it allowed an early opening this year, but even bigger and better things could be on tap for the future. Aspen Skiing Co. submitted an application to the U.S. Forest Service earlier this year with two main thrusts — expand into the Pandora terrain on Aspen Mountain’s upper east side and expand the snowmaking system to cover 53 additional acres at the top of the mountain. The White River National Forest staff and consultants are reviewing the application and expect to release an environmental assessment and draft decision notice shortly, possibly as soon as next week. This season, officials are reviewing requests for more than 430 acres of additional snowmaking across five resorts, including Snowmass, on White River forest land. 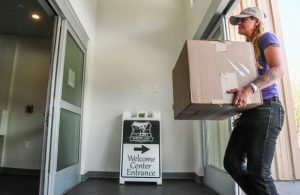 Katie Ertl, Skico’s senior vice president of mountain operations, said the proposed Aspen Mountain snowmaking expansion would increase the odds that the mountain could open as typically scheduled on Thanksgiving Day and offer top-to-bottom skiing. Above Deer Park, the company currently relies on snowcat drivers working with natural snowfall to provide coverage by careful grooming and pushing snow — if there is enough snow to make that possible. Skico applied to expand the snowmaking system to cover One and Two Leaf, Silver Bell, Dipsy Doodle, Buckhorn, North American and Copper Trail. The 2017-18 season spooked the Colorado ski industry when so many resorts struggled to open and snow conditions were generally dismal through December and most of January. Not only was it dry, temperatures were so high that snowmaking couldn’t get started until much later than usual. 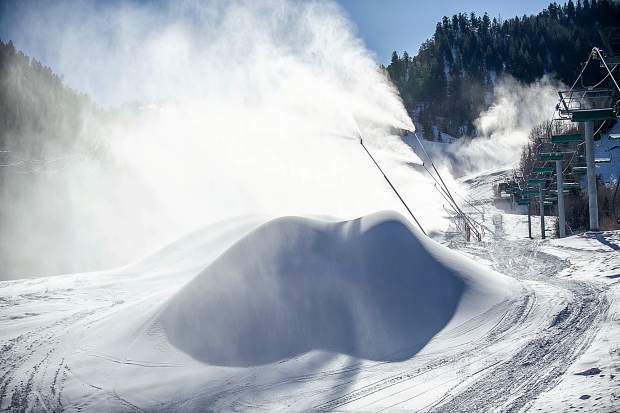 While many resorts, such as Aspen Skiing Co., were already working on plans to expand their snowmaking systems, last season added urgency because of the late starts, according to White River National Forest Supervisor Scott Fitzwilliams. “I think the priority for (the ski resorts) changed last season,” he said. In addition to reviewing more snowmaking at Aspen Mountain, the White River is reviewing projects at Snowmass, Beaver Creek Resort, Vail and Copper Mountain. Snowmass wants to cover an additional 33 acres of snowmaking in the Alpine Springs area to make sure that chairlift’s bottom terminal is accessible at mid-mountain in early seasons when natural coverage is sparse. Vail Mountain wants to add 262 acres of snowmaking by constructing 32.5 miles of pipeline and 14 new valve stations. The project is located on the upper portion of the front side of Vail Mountain. Copper Mountain wants to cover an additional 86 acres of ski trails. Beaver Creek seeks a minor snowmaking expansion of about 3.2 acres to make sure there is a connection between chairlifts. Conservation groups have expressed concern about the growing snowmaking systems and the potential effects on the Colorado River Basin’s watershed, Fitzwilliams said. The Forest Service review examines factors such as: Do the ski resorts own the water or is it available to them? How will the increased snowmaking affect spring runoff? Are the proposed systems efficient and accurate? Preliminary data indicate snowmaking uses a small percentage of water, far less than municipal or agricultural uses, Fitzwilliams said. “We have minimum flows that they have to maintain in the wintertime,” he said, referring to mandated minimum streamflows. While using water to make snow isn’t a perfect system, Fitzwilliams said, it could be argued that it is beneficial by “banking” water in the form of snow and having it contribute to streamflows in June and July, when it is really needed. A primary concern for the Forest Service is making sure the drainages where snow is being directed can handle the additional amounts of water during runoff season. At Aspen Mountain, a new storage pond with an estimated capacity of 3.5 million acres would be constructed near the bottom terminal of the Gent’s Ridge chair, by an existed pond. Another new pond with 2 million gallon capacity would be built near the Midnight run, which starts to the skier’s right of Buckhorn cabin near the top of the mountain. The ponds would be filled by surface runoff rather than stream fed. Skico contends that will help with runoff management. The existing Gent’s Ridge 1 pond, the new Gent’s Ridge 2 pond and the Midnight pond would capture runoff for later use or discharge. That would minimize additional runoff in Spar and Keno gulches, Skico’s application said. Fitzwilliams said Forest Service engineers are checking that assessment.